Ameraucanas are astoundingly beautiful birds, and quite friendly. 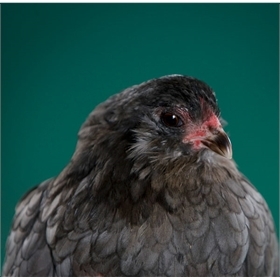 Their small pea combs and sleek body shape give them the aspect of a bird of prey rather than a chicken. 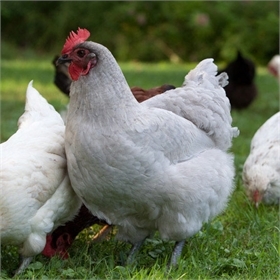 Ameraucanas lay blue eggs and they're a must-have for any rare breed flock. 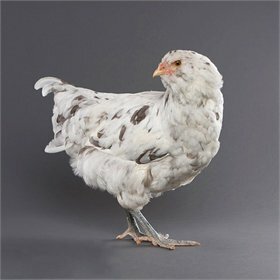 This particular flock has been sourced from a quality show breeder, so you may find yourself with some beautiful, show-quality offspring! These are not the Easter Eggers that other hatcheries deceptively call "Americanas" (and other misspellings). These are true Ameraucanas---and they are also especially high quality lines! 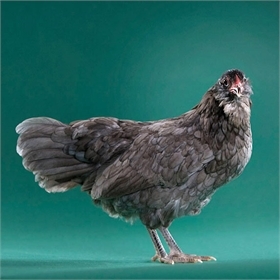 Due to the genetics of the blue plumage color, these BBS Ameraucanas will hatch out with plumages of Blue, Black, or Splash (a white or pale color with "splashes" of darker grey or black feathers as seen in the photo). When breeding blue to blue, you end up with a mix of 50% blue, 25% black and 25% splash. 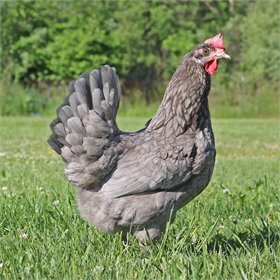 However, in our breeding pen we have lots of splash hens, so your plumage ratio will lean much more toward blue and splash, with fewer black. All 6-week-old chickens are shipped USPS Express Mail, and are vaccinated for Marek's and MG (killed). Please keep your 6-week-olds quarantined from your existing flock for four or more weeks, and take care when introducing them.